In this article we are going to focus on how to create a simple Web API application and access it using any browser such as Google Chrome or Internet Explorer. Web API supports GET, PUT, POST, DELETE methods and it can be used in any kind of applications such as Web Applications, Mobile Applications, Console Applications. 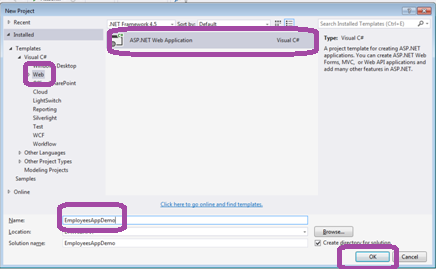 Step 1: Launch Visual Studio 2013 -> File -> New Project -> Select Visual C# under Templates -> Web -> ASP.NET Web Application. Provide the name as "EmployeesAppDemo". Step 3: Go to Solution Explorer -> Right click Models folder -> Add "Employee.cs" class file -> Add below code in the Employee class. 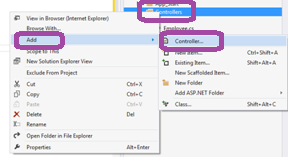 Step 4: Right Click Controllers folder -> Add ->Controller. 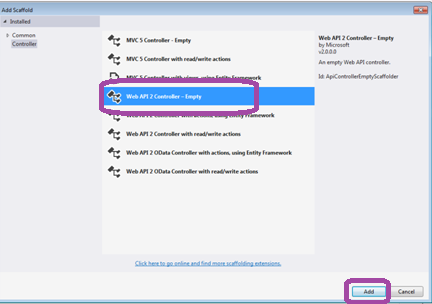 Step 5: Select Web API 2 Controller - Empty -> click on Add. Step 6: Name the controller as EmployeesController. Step 7: Add the following code to the EmployeesController class. /// Gets and returns the employee with the EmpId matching the parameter id value. Step 8: Right click project in the solution explorer -> Properties -> Select "Web" on the Left hand side -> Copy the Project Url as shown below. Here the port number might vary based on the settings. Step 10: This would prompt you to either open or save the Employees.json file. 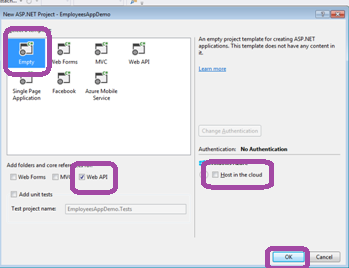 Step 11: you can also append api/Employees/1 to retrieve the specific employee details.